Hays County is constructing a shared-use path on Sawyer Ranch Road from Meadow Creek Drive to Belterra Drive. 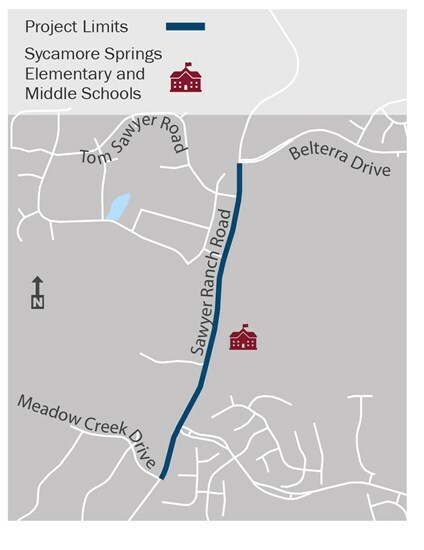 The purpose of this project is to enhance safety and improve connectivity for the community, between neighborhoods, and to Sycamore Springs Elementary and Middle Schools. This is a 10-foot path made of concrete to accommodate pedestrians and cyclists. The County is also constructing a 4-foot shoulder and raised slotted curb along the east side of Sawyer Ranch Road, and adding striped crosswalks at the intersections of Tom Sawyer Road, White Wash Way, Rachels Canyon Drive, and Meadow Creek Drive. Improvements were funded from the voter-approved 2016 Hays County Bond Program.